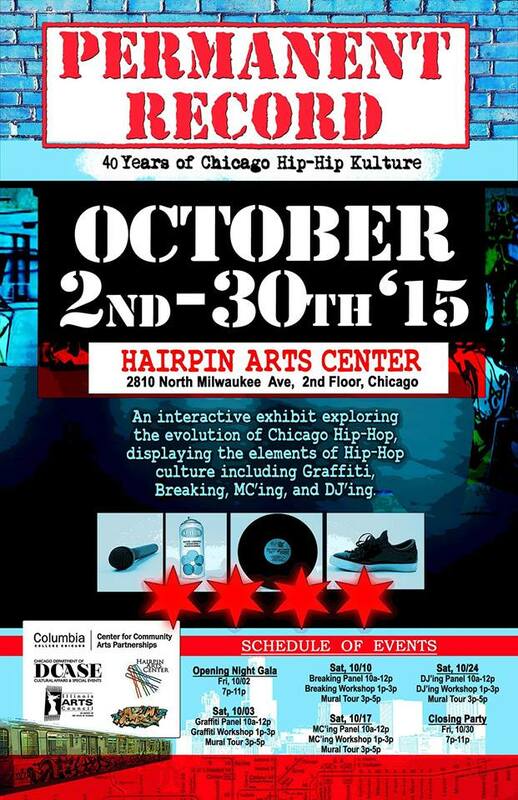 The Artistic Bombing Crew (ABC) in partnership with the Center for Community Arts Partnerships presents: Permanent Record: Chicago Hip Hop Kulture, an exhibit spanning over 40 years of Hip Hop in Chicago, at the Hairpin Arts Center in Logan Square in October 2015. Permanent Record will present, in a month-long run, the evolution of Chicago Hip Hop in an interactive exhibit displaying the elements of Hip Hop culture (graffiti, breakdancing, MCing, and DJing). 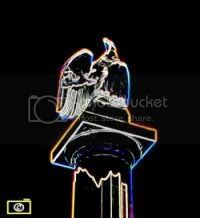 ABC is one of the revolutionary graffiti crews to introduce the Hip Hop culture to Chicago in the early 80�s. Permanent Record, curated by BBoyB, and Flash, with ABC, will invite Chicago�s community to celebrate Hip Hops past and present. Group workshops lead by 1 - 2 guest artist instructors will follow a moderated panel discussion consisting of 4-5 pioneers of a specific element. A tour of Logan Square Graffiti Murals will follow the afternoon workshops. The Opening Night of Permanent Record: Chicago Hip Hop Kulture, a Chicago Artists Month 2015 featured event at the Hairpin Arts Center in Logan Square. This month-long interactive exhibit, which displays the elements of Hip Hop culture including graffiti, breakdancing, MCing, and DJing, invites Chicago�s community to celebrate Hip Hop�s past and present. Presented by the Artistic Bombing Crew (ABC), one of the revolutionary graffiti crews to introduce the Hip Hop culture to Chicago, and curated by BBoyB, Flash, and Risk from ABC, with the Center for Community Arts Partnerships (CCAP) at Columbia College Chicago. El Trains and Alley Entrances: Navigating Chicago Through House Music / Global Dance Party at the Old Town School of Folk Music, 4545 N. Lincoln.